Foursquare, the location based app which lets you check-in to places and share it with your friends and family has been updated for all Android and iOS devices. 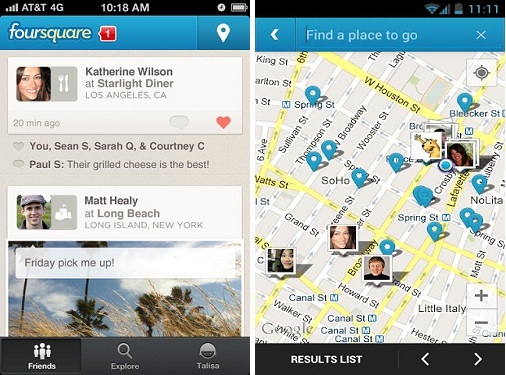 With this update Foursquare has taken care of bringing some important changes to the User-Interface of the app making it more convenient to use on the touchscreen smartphones with improved size of the buttons and text for easy readability. Share and save your experiences wherever you go. Search for anything (from ‘free Wi-Fi’ to ‘dumplings’) or browse popular categories. The Explore tab right in the middle of the top (Android) and bottom (iOS) of the app lets users to find out new places of interest based on the Check-Ins of their friends. Fouraquare has said that an update would be made available to the app for BlackBerry users too but there is no use about it for Windows Phone users. The app is available for download in the Apple App Store and Google Play Store and you can find the download links below.